Candy bouquets for gifts are such a lovely idea and a great twist on the traditional flower bouquets that we have enjoyed for centuries. If you can't bear to give up the idea of flowers entirely, don't let that worry you. 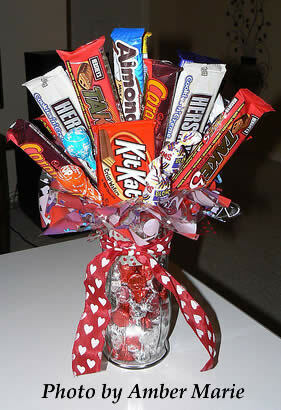 Simply combine both candy and flowers when creating candy bouquets and enjoy the best of both worlds! It has long been a part of our culture to give a little something on important occasions. Be it wedding anniversaries, birthdays, Mother’s day, Valentine’s day, the holidays, baby showers or just an ordinary day that we want to make extra special, a bouquet brings much wonder as chocolates and candies do. Creating candy bouquets for special occasions is not at all difficult. They can be as simple or as elaborate as you like, so don't think for a minute that the whole candy bouquets "how to make" process is more than you can handle. Don't worry, you can Buy Candy Bouquets for gifts, too. If you don't want to make your own gift, but would prefer to order, there's a beautiful selection for you to choose from here. When creating candy bouquets, there are only a few basic items you'll need - something for a base, something for stems, and the all-important candy. Choosing a base is an important part of creating candy bouquets. I prefer to choose a heavy base like a mug, a large jar, a ceramic pot, etc. so that you don't have to worry about "tipping. You can then use a piece of florist foam in the bottom of your base to help in arranging your candy flowers. It's one of the easiest methods when making a candy bouquet with a wide base. You can usually fore-go the foam if you use a base with a narrow mouth. The second important element is the stems of your bouquet. Wooden skewers work well, but if you don't mind spending a bit more, you can use metal skewers. If you are making a small candy bouquet (like in a mug), you can even use lollipop sticks from Candyland Crafts. The third and most important element when making a candy bouquet is the candy, of course! You can use large candy bars, mini candy bars, small wrapped pieces of candy, candy kisses, etc. Their are several ways you can attach the candy to the stems. You can insert the skewers right into the candy, tape them to the skewers, or use a hot glue gun, if you prefer. There are pros and cons to each method, so you'll have to choose which is best for your particular candy bouquet. Candy bouquets for gifts are now a top pick for people who want to add a fresh twist to gift giving. You can personalize the gift even further by choosing candy wrappers and decorations in team colors, pastels for a baby shower, etc. When you make candy bouquets for gifts, don't forget to take a photo and show them off here!